On Screen: James Bond (Roger Moore) is on the tail of mysterious lover and confidant to the one-million-dollar-hitman Francisco Scaramanga. He follows Andra Anders from the casinos of Macau, where she collects a secretive package, onboard the ferry to Hong Kong. Here she is to meet with Scaramanga aboard his junk, but not before stopping the night at the Peninsula. Just when Bond thinks he has lost the girl, Mary Goodnight, stationed in Hong Kong, reminds Bond of the Peninsula's famous fleet of Rolls-Royces. It was into one of these that Anders stepped before speeding off for her destination. Later, Bond establishes Miss Anders is staying in room 602 and breaks his way into her hotel room to confront her about Scaramanga and discover the secret of the Macau collection. 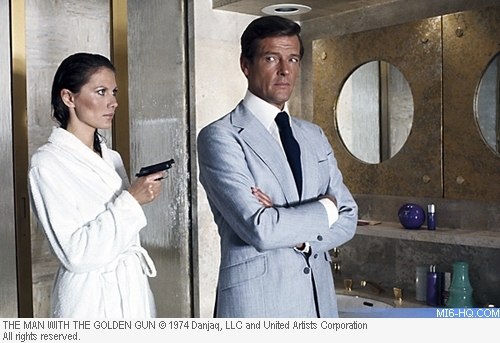 Here Bond finds Anders is involved in the smuggling of Scaramanga's famous golden bullets. She surprises 007 by pulling a pistol on him, even as she is gracefully emerging from the shower cubicle, but Bond gets the upper hand and pumps the girls for information. "The subject under surveillance is occupying room 602. I'll buy you dinner tonight, Goodnight, but first I have a little business to attend to." In Person: At the time of filming 'The Man With The Golden Gun', the hotel's fleet was comprised of Rolls-Royce Silver Shadows, plus a lovingly restored 1934 Rolls-Royce Phantom, but these days modern visitors are chauffeured in modern Rolls-Royce Phantoms. At the time of ordering these in 2006, this was Rolls-Royce's biggest ever order. 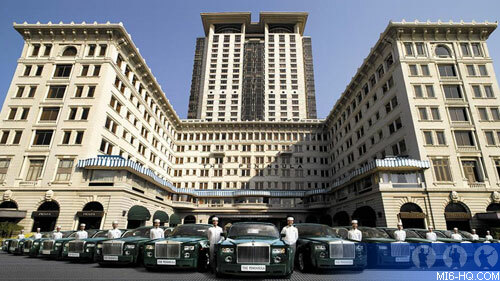 All the cars ordered by the hotel are painted dark green and – as Goodnight observes – the only owner of a green Rolls in Hong Kong is the Peninsula. So connected are the cars to the brand of the hotel that many tend to refer to the cars as "peninsula green" coloured. The hotel has a long history, dating back to 1928, and was founded by the Kadoorie family - a Jewish family of businesspeople who began their work in British India, before branching out into other Asian locations. It was built with the expectation that it would house the finest dignitaries from across the globe, but it had a more ignoble role in the Second World War when the British Governor of Hong Kong finally surrendered to the Japanese there and was later under house arrest in one of the Peninsular's suites. Visiting today doesn't recall memories of these events, rather the 5-star, centrally located hotel has a clean, lavish and bright atmosphere. Housing over 300 guests and eight restaurants, visitors have a plethora of entertainment to choose from. In the 1974 film, rooms and corridors were replicated in the studio, so visitors will explore the interiors of the hotel without the preconceptions of the filmmaker's cinematography. 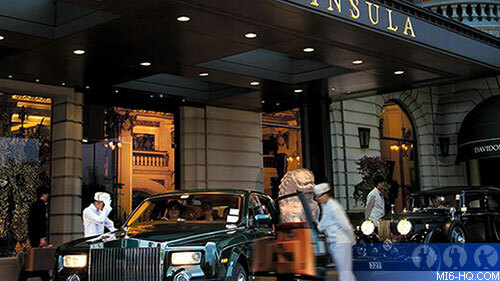 The hotel is also home to one of the oldest fashion arcades in Hong Kong, whuch has housed some of the world's most famous brands including Ralph Lauren, Cartier, and Dupont. By contrast, its large 30-storey tower is a relatively new invention, built in the 1990s; it houses offices and includes a private helipad. For the super-wealthy, Peninsula offer their 330 square-metre Peninsula Suite on floor 26 of the new tower, with a dining room to seat 10 and a butler on 24-hour call.